The land in question is outlined in yellow. Map courtesy Montara Water and Sanitary District. It’s been nearly 20 years since voters passed Measure T, paving the way for the construction of two tunnels to bypass Devil’s Slide. Few Coastsiders who were here at the time could forget the controversy that preceded it over the state’s proposal to push Highway 1 inland on the Midcoast. 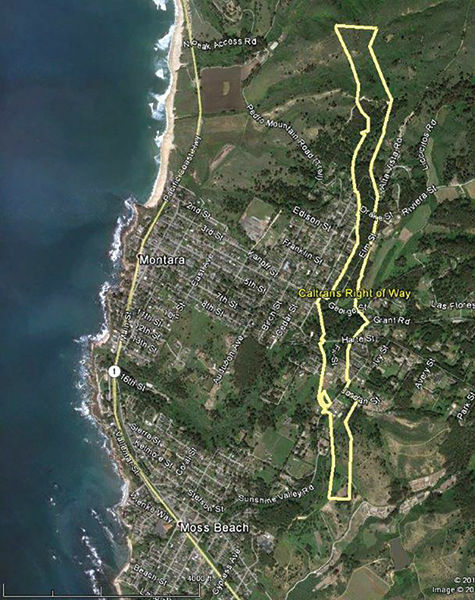 Known as the Martini Creek Bypass alignment, it called for a roadway that would run from Pacifica over Montara Mountain and past Martini Creek to the south before reconnecting to Highway 1. The highway segment could accommodate four lanes of traffic and would have cut through McNee Ranch State Park. The Committee for Green Foothills, Sierra Club and the owners of Shamrock Ranch sued Caltrans to stop the bypass. The lawsuit allowed time for an independent panel to come up with the best solution for a Devil’s Slide bypass. It recommended a tunnel, and the environmentalists gathered enough community support to put the issue up to a countywide vote.